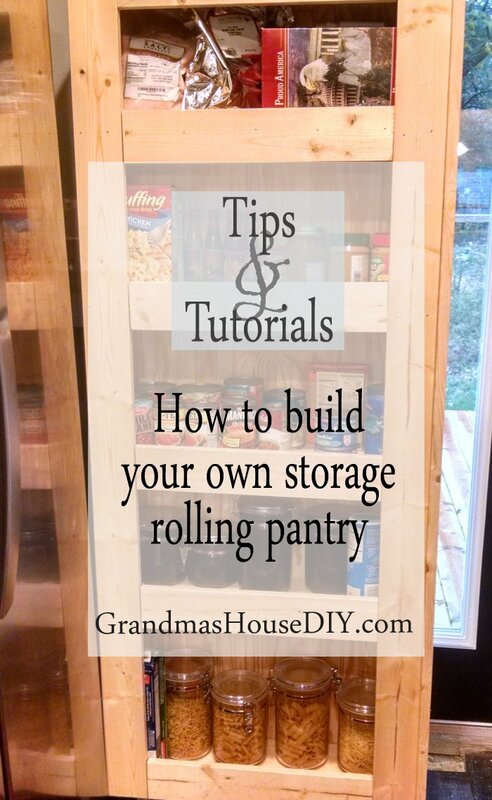 How to: Build your own rolling pantry! Wood working DIY How to! I knew from the very beginning with Grandma’s house that the kitchen would end up being a bit of a galley. At first I leaned to using the closet under our stairs for our pantry but it worked out too well for that to be our wood storage. 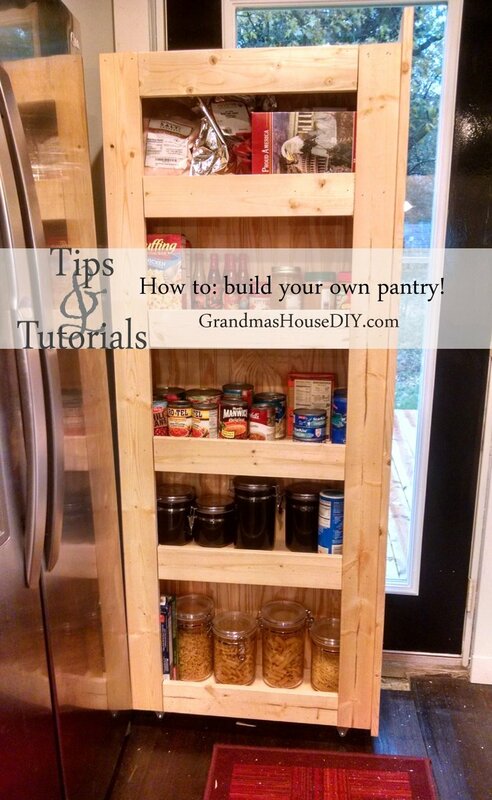 I also knew that we would probably have enough storage to make it work without a pantry but upon running into several, narrow, rolling pantrys on Pinterest (Check out this one, isn’t it gorgeous!?) I knew exactly what I would be building! I have lived in several houses now with the nightmare situation of having a refrigerator smack up beside a wall, making it impossible to open it more then half way. How on earth anyone manages to design a kitchen with this horrible flaw is absolutely beyond my comprehension. So, moving the refrigerator over a little (so we could open it fully) meant I created the perfect little hideaway for a rolling pantry. You can see in the above picture that I had a couple of things I needed to do to “prep” the spot first before I got to building the pantry. It had to sit far enough out from the wall to clear the light switches so I added two 2x4s to give it the support it needed and also to bring it out for the clearance. 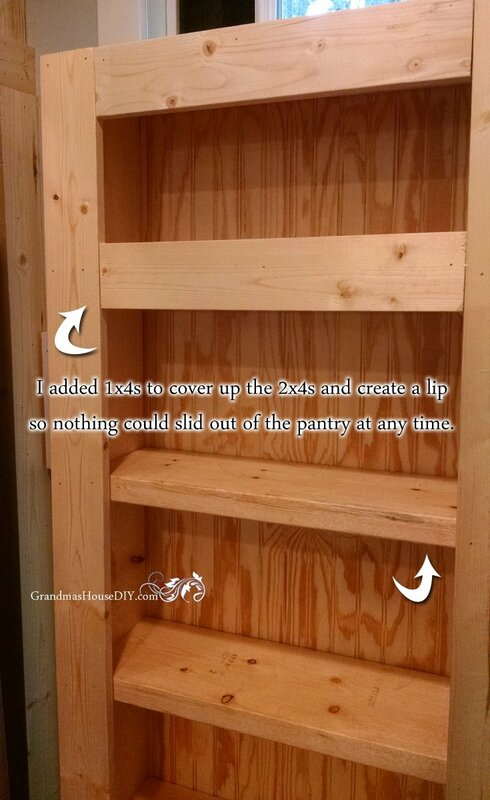 I also added this going straight down from the cabinet above it (I built this pantry meanwhile I was also building the above the refrigerator cabinet so I could trim this pantry out along with the cabinet above it). I chose to build the whole thing out of 2x8s knowing that that would give me a 7 inch depth. From there I took some measurements. To get the height I also made sure to account for the height of the casters I chose. To get the depth I made sure that the pantry would not actually hit the wall in the back. It was just a case then of getting all of my boards cut and screwing it all together. I chose to put the shelves about every foot. The casters I chose DO NOT swivel, I made certain to get the ones that were set in one direction and then, when I attached them with screws, I put them as widely spaced on the bottom of the pantry as I could. Because of this the pantry actually stands on its own as long as no one (or any big dogs…) bumps it, though it will never really need to. We had several pieces of bead board left over from when we covered my ceilings so I’ve been using it pretty liberally for all of the kitchen cabinets etc. I simply cut a full piece of bead board with a jig saw and tacked it to the back of the pantry with my brad nailer. Unless we were standing literally outside the house on the deck, with the back door open, we would not be able reach for anything on the other side of the pantry anyway. These shots I took after I stood it up and made sure it fit, I should have trimmed it out first but it was getting late and my husband got home from his own day job so it was time for me to call it a night. Besides, I just had to see if it worked! You can see how out of level my floors are by looking at the gap between the pantry and refrigerator, oh well, its an old house! 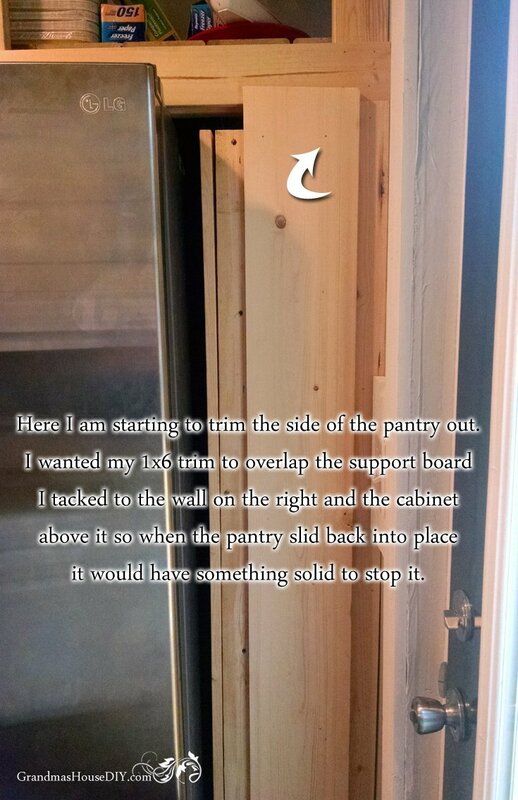 You can also see I had already tacked on the 1×4 trim running down both sides of the pantry but I still had to add the trim to each of the shelves and the front. Ok here we are now with my trimming out the whole pantry. This was a little tricky when it came to the material I had to work with. (I own a small car that will not accommodate much and we’re ten miles from town so I just work with what I’ve got most of the time if I can.) All I had in the garage at this point was either 1x8s or 1x4s… and I couldn’t use either of them to make me happy. So, I ended up using one 1×8 and one 1×4. You can see how I over hang the 1×8 by quite a bit so when the pantry rolled back the 1×8 would hit the bottom of the top cabinet and all along the right side of the 2×4 brace I put on the wall (which I also covered in a 1×4). When the pantry is rolled away it is completely supported and is not so deep that it hits the wall behind it. And there you have it! After two coats of paint and two coats of poly on the front of it I added a simple chrome handle and am absolutely over the moon with how much storage we have! I emptied out my cabinets of ALL of my dried goods, baking goods, pasta and canned goods and they all fit! And I was finally able to bring everything into the kitchen and store it there. No more crock pots in my entry bench! And no more random appliances taking up room in my hutch! Some updates have happened since this post! Check out the entire kitchen reveal post here! I’ve always wanted to build one of these! Pinning! Thanks for linking up at Welcome Home Wednesdays! Thank you Rebecca, we love it! Oh my gosh!! This is so perfect! I have been wanting my husband to do this next to our stove! !Thanks for sharing on the Pleasures of the NW’s DIY party! Thanks Helen we love our rolling pantry!! I would recommend it for any kitchen, it is absolutely amazing how much stuff I fit in it! I can’t wait to see how you dress it up. Clever and yes, more storage indeed. I love when we can get creative with unused space and create actually more. Great job. Thank you Michele, we love it! too cool! I don’t have that space but I know some others I could do similar too! 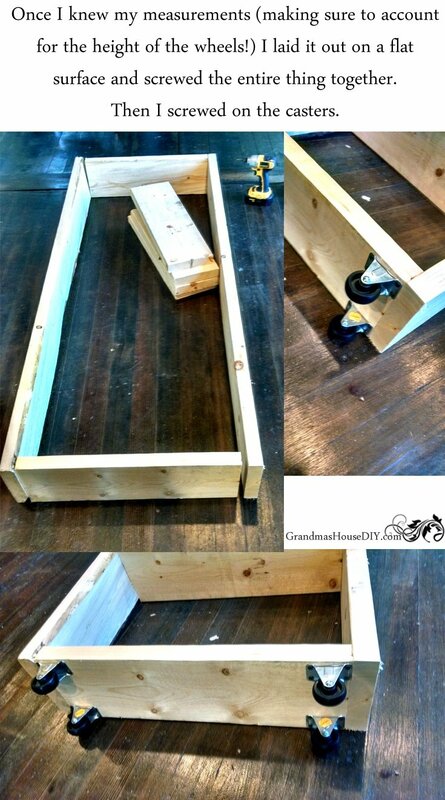 Brilliant and thanks for sharing the diy! Millie, we love it! It creates so much storage that just disappears when we roll it back! What a great build! I love it! Pinning! Thanks for sharing at you’re gonna love it! Taralyn, great use of a small space that now becomes totally functional. Thank you for sharing at Your Inspired Desgin Link Party. Thank you Carol 🙂 We love it! Excellent idea. I need this. Thanks for the post. This will be my feature tomorrow at Our Simple Homestead Hop! Such a great idea. So handy and a fabulous way to take advantage of wasted space! Thanks for sharing it with SYC. Tara, Your pantry looks great! It has to be nice to have your dry goods in the kitchen. Good Job. Sylvia D.
Wow! This is awesome!!! I LOVE this idea! Just today I was thinking once my daughter, son-in-law and 16 month old granddaughter move into their home, my house will need a major organization overhaul. I am so impressed with your skills! You really nailed (pun intended) this project! You certainly created a great amount of storage, I am amazed at all of the space there! Thank you so much for sharing at Celebrate Your Story! Thank you Chloe, I use it every day and just love it! You are so creative!! What a great project!! Thanks for sharing on My 2 favorite things on Thursday! Pinned! Fabulous! I wish I had a set up that I could do that. Unfortuneately, my kitchen is sooooo tiny with zero wasted space. Your project came out really nice. What a lovely, functional project! Nicely done! You are certainly talented! Thanks for sharing. 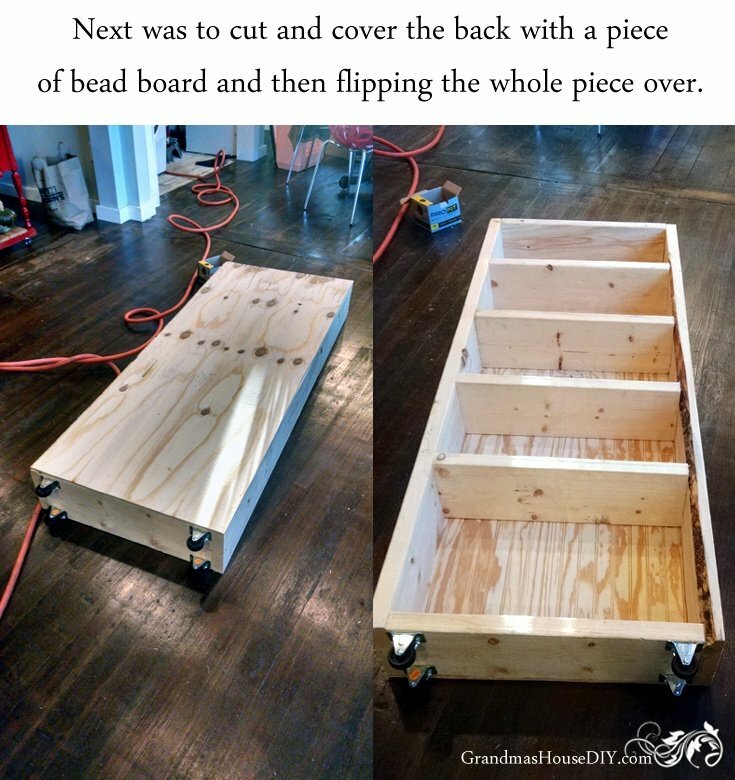 Thanks for sharing your completed project at the Happy Now Link-Up! Thanks Jen, we really love it! Great idea! 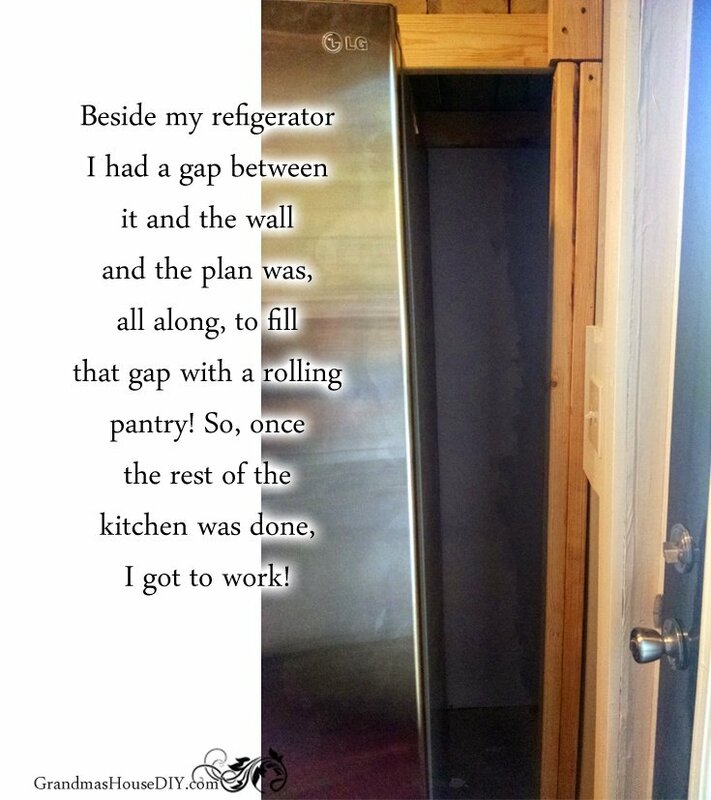 I think many of us with older homes have a few awkward spaces, especially where the fridges go! I know I do. That’s where I keep my paper and reusable bags but I can see now it could be so much more! Thanks Mollie, we love how much storage it gives us! Wow, that’s awesome. We turned out coat closet into a pantry, but there’s a space by my fridge that would be perfect for this! Kathryn, thanks so much for coming by! That is a very smart idea! Thank you for sharing at Home Sweet Home! Very nice post, I like your rolling pantry! Thanks for sharing with us on the homesteader hop! Thank you Carla! We love our pantry, I use it every day 🙂 I’m thinking about building something like this eventually for our shop but much bigger for paint! What a neat idea. We have such a small kitchen and need more space. This would be a fun project. Thanks for sharing. Perfect idea for that space! I love the idea of fixing up your grandmothers’ furniture too. The people at Hometalk.com would love to see this! Hey Angie, we love our rolling pantry! I was thinking about making one for our work shop too for paint! Thanks! Great job! I don’t have enough room next to my fridge to do this plus I have almost too much storage space (if that’s possible) in my current house but I am planning to downsize in the future so I’ve pinned this, it’s such a great idea! Oh Martha, thank you so much! I was so fortunate to find Joe, not very many men out there would have been up for such a undertaking! But that’s how I knew he was the one 🙂 Thanks again! More storage is terrific and hidden storage is even better! You did an amazing job here 🙂 Thanks so much for sharing at Together on Tuesdays! Looks so nice! What a great job. This is a great project. Thanks so much for sharing this over at Let’s Get Real. I have a super tiny kitchen and I am always looking for ways to make it more functional. It just takes a little thinking. I have some friends that I know will love this project as well. I’m going to share this with them. 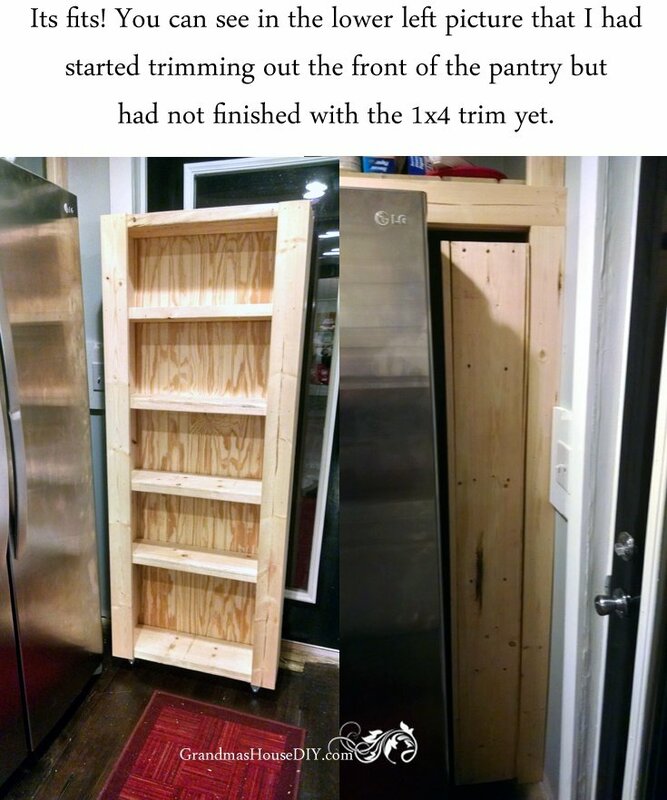 Christine, I really love our pantry, I’m thinking about duplicating it for in our garage too, I can’t imagine anywhere where this wouldn’t work for great (and hidden storage) I saw the idea on Pinterest years ago so I had planned all along to build one for our kitchen. I knew it would be cool, but I had no idea how much I would love it! Thanks!! 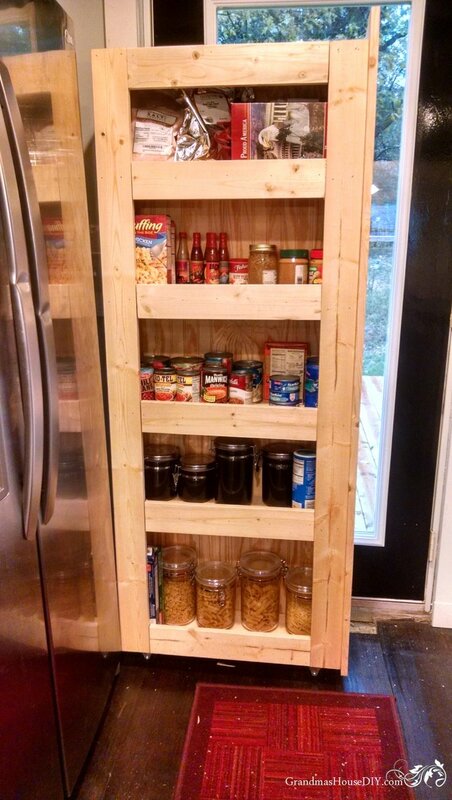 This is a great storage idea and you built such a wonderful rolling pantry. Thanks for sharing this with us at Snickerdoodle! Pinned. Alicia, thank you! It’s such great easy storage! Great project! I love how it was useful as well as cute! I featured this project on A Little Bird Told Me this week. I am so happy to have your posts on the Blogger’s Pit Stop, they are so very interesting, practical and helpful. The projects you do are amazing. Oh Kathleen, thank you so much! Yay, thank you so much!! Many years ago when dinosaurs first roamed the earth and I lived in a house trailer we made one of these type of pantries. They add so much storage and the ease of access is amazing. Every home should come with one of these. Love your version, I bet you are going to enjoy it every day for years. Oh I totally agree, this was one of those projects I couldn’t wait to build and start using! They really are just a brilliant use a space. Thanks for coming by! Tarahlynn I love seeing your projects they are so clever and I wish I had room for one of these in my Kitchen !! What a great functional project! Thanks for sharing! What a neat idea, Tarahlynn. 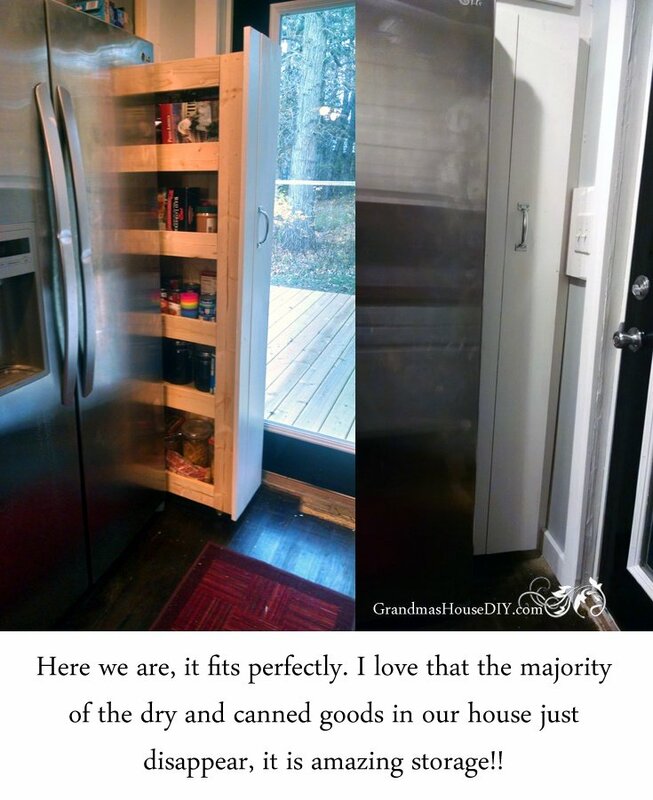 I have a very small kitchen and this might be a great solution for some extra storage. I’m visiting from Sew It Cook It Craft It. Thanks for coming by Megin! I adore our pantry, I still can’t believe how much storage it offers! Wonderful! It turned out great! Thanks for sharing your tutorial at Sew It Cook It Craft It. Just hopping back to let you know that I’m featuring you today at the Sew It Cook It Craft It Link Party. Lina thank you so much!! This is such a good idea! I have never seen one of these before. Pinned. Thanks for sharing at the Friday at the Fire Station link-up! Thanks Jen, it provides us an incredible amount of storage! Thanks for linking up another great DIY!! I love it. I want to have one of these for my kitchen, however with my little lately, I’ve been contemplating whether she would play chef with all my spices if I put them in her reach. (She’s done that with my huge container of sugar, the pepper, and salt. It was a mess…) Nonetheless, I absolutely love it and as always, you did a stunning job! Thanks Emily! It was part of my kitchen plan from the very beginning because I had been drooling over other rolling pantry’s on pinterest for months! I absolutely love it and can’t believe how much storage it offers. This is such a great idea, esp with the little wheels! I love it, in a bigger kitchen it could also save so much walking back and forth if you could just roll it close to the area where you are working and later shove it back into its little space. I have to keep this in mind when we redo our kitchen next year! Yup this was literally a must have when I designed my kitchen, I always wanted one! I tucked it in beside the refrigerator so it would kill two birds with one stone. Firstly it gave us great storage and secondly it brought the refrigerator away from the wall far enough so it opens fully now! I’m actually thinking about building another one in my workshop, its just so handy! Perfect storage solution for any room! I need several. Thanks for the awesome tutorial. I will put this to good use soon! Oh Sue I just love it and use it every day! I’m thinking about building another one in my workshop for paint and things! Me too! Thanks for coming by, have a great weekend! You are one gifted lady! What a wonderful idea!! Perfect for my kitchen too! I’ve pinned it! Thank you so much for this inspiration! Thank you for coming by and reading Emmi! What a wonderful idea to have a rolling pantry. Your directions are very well done and great pictures to follow. Congratualations on being featured on Homestead blog hop! Have a healthy, happy & blessed day. Pinned & tweeted! Thank you so much for coming by Marla and checking it out! This is amazing! What a great way to use that little bit of space! Thank you for sharing the tutorial at The Really Crafty Link Party. Pinned! Thank you so much Teresa!! It has become my favorite storage in our kitchen! You are so creative and handy! I love that the rolling pantry has wheels! Thank you Annette, it has become my favorite storage in the whole kitchen! Have a great week! Thank you so much, this has become my favorite storage in out kitchen! Carrie, this is totally my favorite storage in our whole kitchen! Thanks for coming by!